All YB3MM & YC3MM and derivative callsigns via Antonio IZ8CCW (direct, OQRS or Italy bureau). ③YB3MM/7 from OC-166 (island and time are not fixed yet). address and do you know if he QSLs? >  JS6RGJ is same as JM1LRQ Nobu. >  Please send him your e-mail. My friend Col who is DX-World.net editor supported for OC-208 pedition. This is the message on DX-World.net today. UPDATE: Reports today suggested activity from OC-208 was scheduled for this weekend and to run until May 2. This info is not correct. 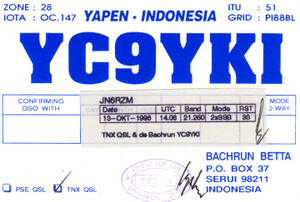 John YB5NOF and Anton YB5QZ applied for a special callsign today, and hope to then be QRV from Banggai OC-208 around mid-May. If a special call is not authorized, John and Anton will instead sign /8 from Banggai. You will get successful IOTA pedition, I think so. 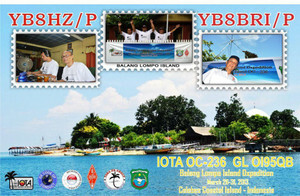 Rcvd YE9IOTA today from YB9BU. Tnx Kadek! I just found your article about IZ8CCW and want to inform about QSL situation here. 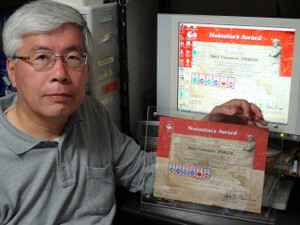 Not received following qsls from him. I even not hope to get current expeditions YB3MM/6 YF1AR/6 XX9TYT. I am sending buro qsls every few year to him - nothing. I send direct request - nothing. 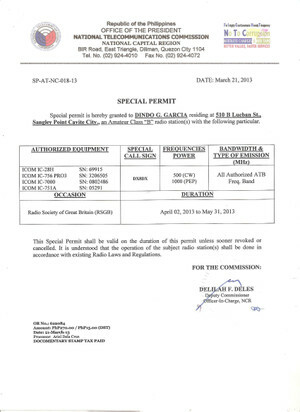 One time he promised buro qsls (appr 1/01/2009)-nothing received. My opinion - it is not best choice for qsl manager. もう少し、海外からのご報告が欲しいですね。悪口は不要です。事象をレポートしていただけると本当にありがたいです。If you would like this message for English version, please say to me. I rcvd return from JE4WOK. Can you sent for me correct post address? 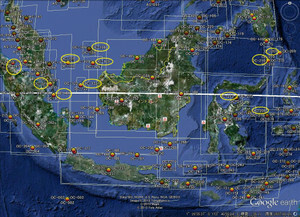 many Island around RIAU it can count for Nusantara Award, like Kundur, Tebing Tinggi, Jemur, Karimun, Moro, Bengkalis, Rangsang, Burung, Topang etc, I think more then 50 island hi hi so all island vy easy to go there from Pekanbaru. any way I HAVE NOT IOTA AWARD UNTIL THIS TIME...I have more then 100 island qso and have confirmad but may be too old so I don't know can count it or no. is not good. Do you have a correct e-mail for him? IB, BG7KR, BG7NI, BG7NQ, BG7RW, BG7SV, BG7SX, BG7TQ and more HAMs. Special thanks BI7W QSL card sponsor: EA5KB . -mail. He has all QSLs of AS-094 BA7JA AS-129 BD7JA/7 AS-131 BA7JA/7 AS-139 BI7W AS-143 BI7Y more than enough.But he had postal accident for all letters. If you want his QSL management,please send me your message. The only address that was NOT rejected was BA7IB! Perhaps I will hear from him!? I do not think I will get a card from BI7W! I think we have to report to GDXF and DX news for correctly callsign and OC-208 starting and ending dates. Now it's a YE8B and from 26th Apr to 2nd May. Our limited is till Friday morning, I think so. How about you? John-san. The OC 208 licence will get it on the last of April #may be# so we will go there there on MAY. Now I'm in pekanbaru and Anton suggest me, better the activity starting on the mifdle of MAY...how about you Shu san...???? Thank you very much! It's OK for our publishing. I will inform to GDXF and IREF. And I pick up this infos on my Blog. Thanks!! Let's try to operate from OC-208 Banggai Island for JA friends. Do not worry, John-san. YB5NOF John says; Maybe, the OC-208 Banggai Island license will get it on the last of April. So we will go there on middle of May. Please be QRX. Soon we will be announcig for the starting date and so on. I think it's OK for publishing to GDXF and IREF. Please send me your permit. I announce for your OC-208 operation exchanging informations. Electric condition is very bad here, down until 180V and oftenly off. Last night could only made 35 qso. JA only JI3MJK. I will work only ssb on 21.260 + 5 to 10 up. Will try again tonight as last chance, between 12 until 17 UTC or wait until voltage stable. Hope to work you Fred. 73. Bring TS-450 (very heavy hi hi hi) and some other equipments. 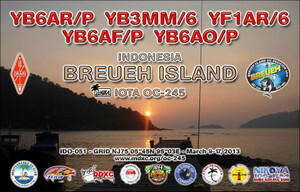 YB3MM/2 and YB2TET/P from Karimunjawa OC-186, 13-16 April 2013 (still waiting permit from hotel). Holiday style operation. 17:00~06:00 local time, low power, ground-plane 15m band SSB only. YB3MM/7 from Tarakan Island OC-166, targeting on coming IOTA Contest 2013.
our dx'pedition may be changed until the middle of May and we hope the weather will be better. 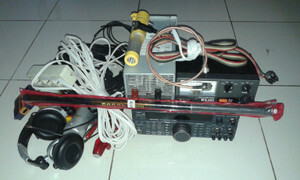 I'm in Pekanbaru waiting for the license and prepare our equipment especially our antena. Thanks John-san. I understood. I and my Japanese friends hope everything will be well. We are waiting. OK for ur cooperation, my best regard to you and the Japanese friends whose give us support. This is not an expedition, but will take advantage of free time after work and survey. As of now Alex RW3RN is catching up with RI0K/p QSL requests. Thank you for your patience! Estimated dates for RRC 20 years anniversary IOTA conference in St. Petersburg are Sept 6-8th. Website with details and registration will be up soon and announced. RRC welcomes international participants and will help with visas and logistics. Today I sent QSL direct for JG3LGD. Some time ago I sent direct QSL from RI0K to JA7DHJ. Today my envelope is returned with mark on Japan language. I have not E-mail for JA7DHJ for correct post address. Toku, JA6TNY will be active from Awa Island(AS-117) as JA6TNY/0 on 20-21 April. he will operate mainly 14MHz CW and SSB and on 160-10 metres. His QTH is in WLOTA　LH0477 IOTA AS-117 and JCG　No.0801. This operation will be from at 0700z 20th to 0300z 21th. Shu san...until to day I still can't make the paypal account... So forget it about donation...you can collect it and after I have my paypal account you can send it to me. Our urgent problem is ANTENNA, we can't operate on all band with our home brew antenna, please contact Anton YB5QZ, he have an idea, how can we get a good antenna from Tokyo with a vy cheaper cost. That's all my friend, to day I will going to ORARI office and tray to take our license, I hope it just ok.
YB3MM/2 from Karimunjawa OC-186, honey-moon style operation (with YB2TET). Me too, Shu san...I believe the activity from BANGGAI ISL will be OK, don't be afraid hihi...maybe we get trouble for the antenna, by the way we will tray to do the best with all the equipment we have. On that moment, we have ladies for CW mode his home call is YB8NLF. Shu San...what you mean about it hi hi...??? Probably next year I will on from Miangas Island no number for IOTA but that island located vy closed to Philippine...it's can count for Nusantara Island Award. To tell the truth, I would like to pay for your lack of donation from me. But I am now pensioner. I have not many money now. my hi hi is means of my poor man. Very sorry. I got the call DX8DX approved already. 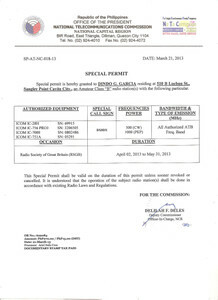 Its validity is from 02 April to 31 May 2013.
challenging part of the IOTA activation. As of now, the latest availability of watercraft that would take me to Bongao, Tawi Tawi is on the 3rd week of April. 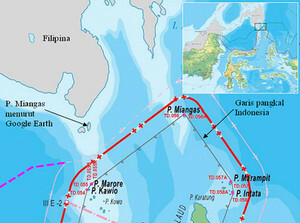 After about a week of staying there will proceed to Taganak Islands. This are just part of the plan, as some part of this activity is beyond my control, I couldn't give exact dates, but will inform everyone thru this email of the latest updates. 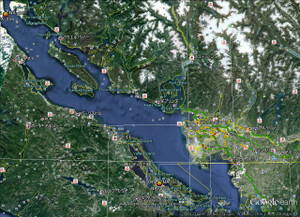 call by areas, and will operate split. CW will be the preferred mode of transmission followed by phone. Sorry, no PSK, RTTY etc mode for the mean time. i will publish operating frequencies in advance to lessen confusion. I will operate only 100watts as power is limited, but will make sure my setup is optimum(proper grounding), radials, logging software, auto keyer etc. [ April 1, 2013 to April 8, 2013. ] UPDATE: Full details here. On 20th March 2013 and after several months of trying, Dindo DV1UD finally received the information that he was being given permission to land on and activate three of the ‘most wanted’ islands in the DU area. > I will be supporting for your OC-174 and OC-255. > Yes, many IOTA chasers will be happy.